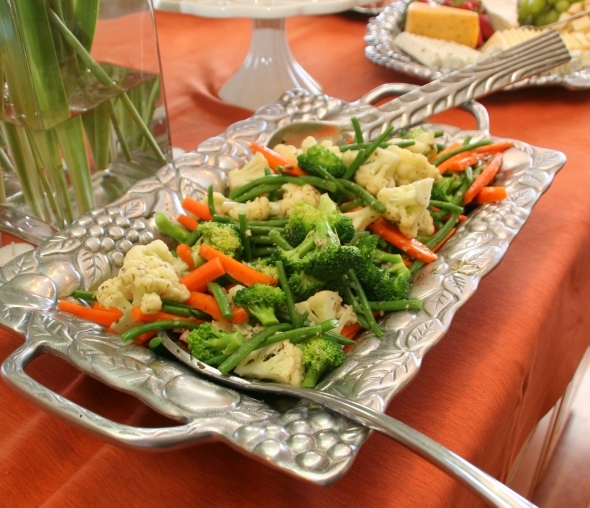 This healthy side dish is great for entertaining. The vegetables are quickly blanched to create a slightly cooked texture with a lot of crunch then tossed in a shallot vinaigrette for a light tasty flavor. It’s a perfect side dish to accompany meat and potatoes, or can be served as an appetizer in place of a veggie tray. The portion is large enough to feed a crowd! Heat large pot of water with a pinch of salt and bring to a boil. Fill a large bowl with water and ice cubes. Blanch cauliflower for 30 seconds in boiling water, transfer to the bowl of ice water using a slotted spoon to stop from cooking. Cauliflower should be slightly cooked yet crisp. When cauliflower has cooled down, remove from bowl of ice water using slotted spoon and set aside. Repeat process with broccoli and carrots. Repeat process with green beans cooking 30 seconds longer to equal one minute of total cooking time. Allow vegetables to completely cool then cover and refrigerate until cold. Whisk all ingredients for the shallot vinaigrette in a small mixing bowl. Gently toss shallot vinaigrette over vegetables, mix thoroughly and serve. *Vegetables can be prepared one day ahead and stored in a large airtight container. The shallot vinaigrette can be prepared one day ahead as well. Toss together before serving.